On this page we talk about more about pressure switches, in particular, compressor pressure switch adjustment. If you have just landed on this page, here is page one of information about air compressor pressure switches. Why is there a need for compressor pressure switch adjustment? Really, the only time you should have to adjust the compressor pressure switch is when you replace the existing switch, and the new one has not got the same pressure settings as the old. A lot of folks have an air compressor with a cut out pressure setting of, say, 120 PSI and a cut in pressure setting of 90 PSI. They perceive that they are not getting enough air, or high enough pressure, to properly run their air tool. As a result, they want to turn up the pressure settings on their air compressor with the mistaken expectation that in doing this, they will have more air to run their air tool longer or more effectively or they can make an air compressor that is rated for 120 PSI top pressure provide higher air pressures. The factory settings for your air compressor pressure switch are the correct settings. Your compressor is designed to run properly at those cut in and cut out settings. In attempting to establish pressure settings higher than those from the factory, a compressor may become unsafe, and it surely will self-destruct a lot sooner than expected. Attempting to turn up the compressor setting to try to run a high-air-demand air tool more effectively will not work. If your compressor hasn’t got enough capacity to run your air tool properly, you need a higher capacity air compressor, not a pressure setting that is higher than the compressor is built to provide. You may still need to try to adjust the setting on a new pressure switch to match the old pressure switch settings. To make a compressor pressure switch adjustment you will need to remove the cover from your pressure switch. Be careful! Shut off the power to the compressor. You are exposing live wires inside the cover, and adequate care must be taken to ensure you don’t give yourself or a bystander a fatal shock. Assuming your new pressure switch is adjustable, some are not, the process of changing the settings will depend on the type of adjustment your new pressure switch has. In the photo below, the cover has been removed from the pressure switch. The two, white coated, items inside the red circle are the pressure setting adjustments for this switch. The pressure setting adjustments have been factory sealed to make it clear that adjustment of this pressure switch is not recommended. Do not attempt to adjust the pressure settings with this type of switch. Either purchase a switch that has the same pressure settings of your old air compressor, or buy a pressure switch this is purpose built to be adjustable. This pressure switch adjustment nut & screw. Note the sealant. The first type is a fixed range pressure switch. On this type the cut in pressure and the cut out pressure differential is fixed. By turning the adjustment nut inside the pressure switch, you change the settings of cut in and cut out at the same time, moving the pressure range up and down as you rotate the nut. This pressure switch typically has only one threaded stud onto which a spring and adjustment nut is placed. By turning the nut clockwise you are increasing the cut in pressure of the switch. The pressure range, that is the point where the compressor cuts out, will also increase. If the pressure range of a fixed range pressure switch was 45 PSI, for example, and the normal cut in pressure was 90 PSI, then turning the adjustment screw clockwise may change the cut in pressure to 95 PSI. The cut out pressure would automatically become 140 PSI, or 45 PSI higher. Turning the adjustment nut further, the cut in may change to 100 PSI and the cut out would become 145 PSI. By turning the adjustment screw counter clockwise, the cut in pressure would drop, and the cut out pressure would drop a corresponding amount. In this type of pressure switch it is common to be able to adjust the cut in, the cut out, and the pressure range of the pressure switch. In the photo above, the two adjustments located inside the red rectangle allow the user to adjust the cut in pressure setting (left nut) and the cut out pressure setting (right nut). Turning either of the adjusting nuts in a clockwise direction will increase the pressure settings, and the reverse if they are turned counter clockwise. On this pressure switch, the adjusting nut in the small red circle is used to adjust the range of this switch. Turning in clockwise increases the range setting, adjusting both the cut in and cut out pressures at the same time. 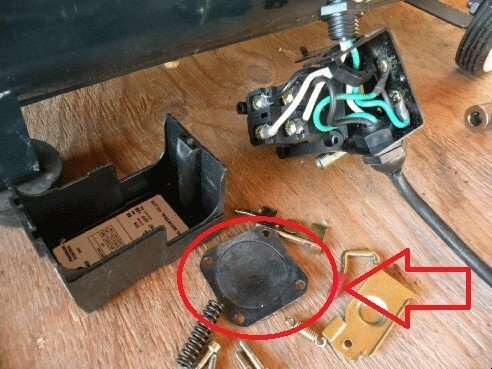 When you open up your pressure switch if you see a setup similar to that shown in the photo above, then your pressure switch is an adjustable type. If you see a setup similar to the image with the sealant on the nut as shown earlier, this switch is not adjustable. Once again, it is our recommendation that you only adjust the pressure setting of a pressure switch to match the pressure setting of the switch you are replacing. Increasing the pressure setting above the factory settings on an air compressor will lead to an early failure of the compressor, and may lead to a catastrophic compressor failure. If you are adjusting the cut in pressure and also changing the cut out pressure, it is not a good idea to have the two settings too close together. If you hear the pressure switch points clattering, or the compressor is cycling very quickly, it is likely that the two settings – cut in and cut out – are too close together. Leave at least a 20 PSI differential, and preferably quite a bit more, when you adjust your pressure switch to help prevent rapid cycling and premature compressor failure. Comments, advice and suggestions are welcome. Replaced air compressor pressure switch control valve. I had to swap the manifold to accommodate my compressor and didn’t pay close enough attention to the positioning of the black rubber diaphragm. Does the “bubble” go in towards the manifold, or out towards the switch? While I don’t “fix” pressure switches, if one fails I replace them all, I cannot tell you the direction, complicated by the fact that you don’t identify the compressor model or the pressure switch model number and I cannot even try to check on your behalf. Perhaps you could provide that information? Right…wasn’t intending to “fix” it, but had to swap out the manifold on the replacement, and wasn’t paying attention when I removed it and the diaphragm. (Had a small case of dumbassitis). Switch is a NYKKOLA Air Compressor Pressure Switch Control Valve 90-120 PSi 240V, Model number B74. Thanks for your help. I was hoping that I could find some documentation for your switch, but see that’s it’s a Chinese knock off which, typically, has no support or documentation as well. I’d guess with the “bubbke” up, but it’s just a guess. I’ve uploaded an image of the switch, photo: amazon.com. So, Murphy lives at your house too? 🙂 Thanks for the update! I have a problem with my elgi air compressor, it’s differential is not as previously. Please suggest me , I have attached a photo of its type. Are you saying that the compressor is cutting in at a different pressure, cutting out at a different pressure, or running and not building pressure correctly. What is the compressor model number please, and have you contacted Elgi in India? I wanted more air pressure going to my impact. 120psi just wasnt doing the job on my truck lugs. I popped the cover off my craftsman 40 gallon compressor & carefully adjusted the torx nut about a half turn in. This shut the unit off right at 142 pounds ish. Right b4 the 150 safety valve opened. Really made a nice improvement in my impact performance. Good that this works for you. I suspect, however, that the longer term effects may be more frequent maintenance as, if the compressor was supposed to run to that pressure, it would have been factory set for that, and not a lower cut out. Good luck with it.